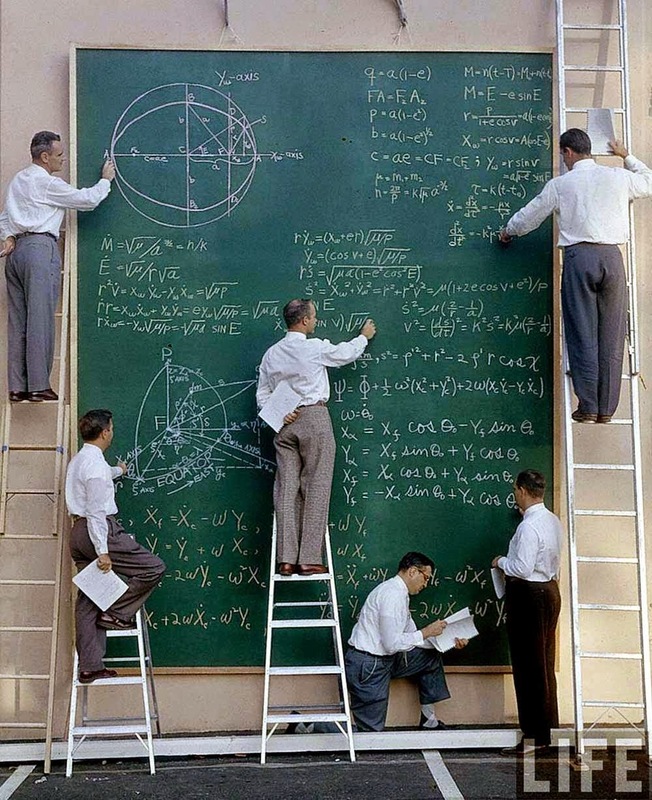 Before the days of Power Point and Prezi, employees at NASA would have to go about conveying their knowledge in a much more laborious way: chalk, board, and likely tears. It wasn’t all in vain, though; 1961 was the year that the first man–a Russian cosmonaut–entered space, and the United States was scrambling to catch up. 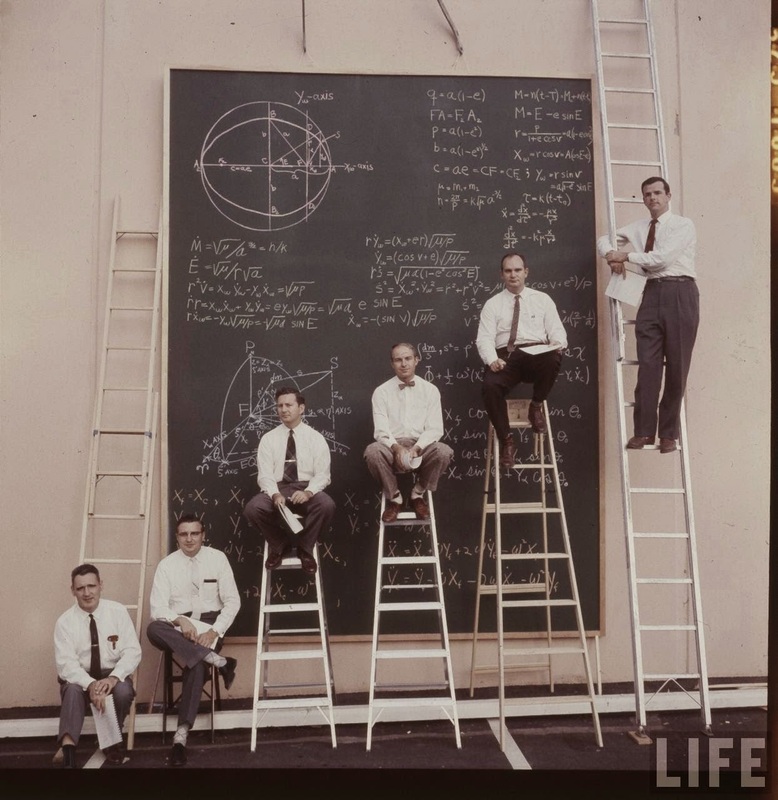 NASA scientists with their board of calculations, 1961. As for this photograph, probably the photojournalist asked them to fill the board with complicated-looking equations for the shot. These are general equations of motion, so nothing that you would not have in a printed sheet of paper. There are no “calculations” in that board, just reference equations. To be fair it was the middle of the Space Race, they would not publish anything other than generic equations in LIFE magazine. There are no “calculations” in that board, just reference equations. Before the development of electronic computers, the term “computer” referred to people, not machines. It was a job title, designating someone who performed mathematical equations and calculations by hand. Teams of people were frequently used to undertake long and often tedious calculations; the work was divided so that this could be done in parallel. In many cases quite sophisticated electromechanical devices were developed to help. For a complex equation that deals with time-steps and feeds back on itself, the prominent scientists of NASA would have “math parties”. Everyone would master one part of the equation. Then the first guy would do his part and hand it off to the next guy and so on. Eventually the final guy would go back to the first person and give him the new inputs for 1ms further in time. After a few hours you could have a nice neat graph of everything over a 1-2 second period. That is how the first nuclear reactors, nuclear bombs and a lot of aerospace calculations were done.